Today is the birthday of Jules Verne one of the fathers of science fiction. As a connoisseur of the genre, which sounds so mush better than the equally accurate "geek", I feel the need to celebrate. I think I may pick up a copy of his final published novel. Paris au XXe siècle (Paris in the Twentieth Century) which was not published until 1994 some 89 years after his death. Or maybe I'll use it as an excuse to pick up the 5 disc collectors edition of Bladerunner that I've been eyeing. Maybe I'll do both. On a far less nerd friendly topic the "Big Game" was on Sunday and I'll share my thoughts on that later. But now the moment you've all been waiting for; the "Art" is unveiled. This is a shot of all three pieces on which I've been working. The one on the left is, at this point, a finished product though I may decide to add to it later; while the other two are at best half finished. But it gives you some idea of what I've been doing; which in all honesty is quite a bit more idea than I have when it comes to what I'm doing. Maybe you can fill me in. 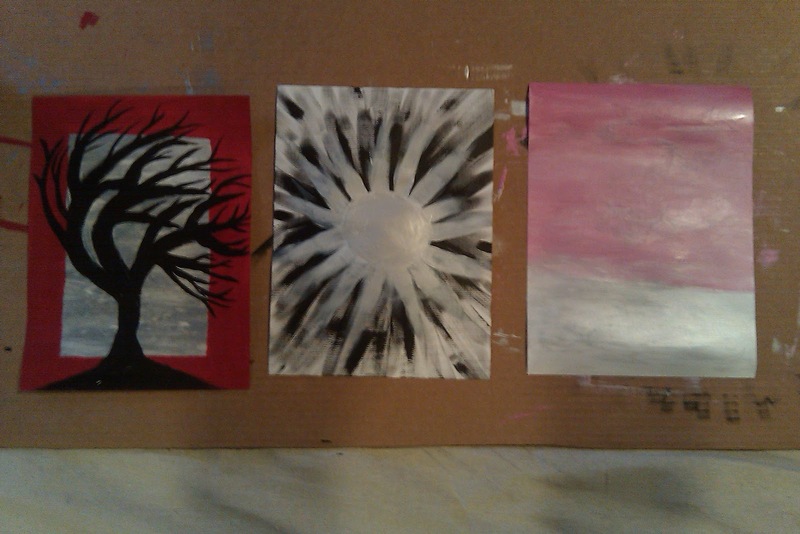 Oh, the one on the right is by far my "fav" and has great potential for the background of a future painting. Somehow I'm not suprised you like the pink and grey one best. I may indeed use it as a background later but for now I only have 4 colors of paint so I may need to invest in a few more colors first.